When you first start coding, the biggest question is which language to learn. 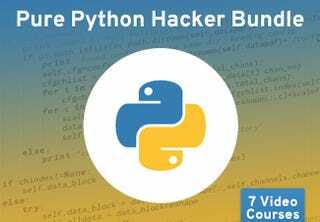 A language like Python provides an easy, beginner friendly start — and this bundle of 7 courses (and over 50 hours of content) offers a complete education in everything from apps, to websites, APIs, and more. Python is the best option for newbies, partly because it's easy to learn, but also because it is a cross-platform language and has a very helpful online community. But by the end of the 52 hours of content, you should have a good working knowledge of Python, (e.g. algorithms, geolocation, bash scripts, etc.) as well as Django, the popular framework. Plus, the bundle takes 91% off the normal price of these courses — check out the link below to grab the deal…or scroll down for more info.